rec. 2017, Air Studios, London. Many of Casablancas’ most interesting works (I cannot claim to have heard anything like all of his considerable output) carry titles which reference other artists or works (not necessarily in the realm of music). But the works so titled are not descriptive or programmatic representations of the works thus alluded to. Casablancas is not concerned with the ‘translation’, as it were, of the externals of such works into music. 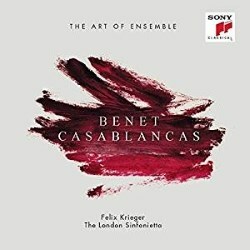 As conductor Felix Krieger says in his booklet notes to this CD, Casblancas’ music “remains always abstract and absolute”. This is because the composer’s interest is in the essence or inner spirit of the works he sometime takes as a starting point. Of the six works recorded here, one pays homage to another composer – Casablancas’ fellow Catalan Xavier Montsalvatge (1912-2012). That Casablancas’ composition shares the date of Montsalvatge’s death is presumably no coincidence. Of the other five works on the CD, two (Dove of Peace and Four Darks in Red) allude to major visual artists (though Picasso was, of course, also a poet and a dramatist) and Mark Rothko; a third, Mokusei Gardens alludes both to a novel (Mokusei! ), first published in 1982 (an English translation followed in 1985), by the Dutch writer Cees Noteboom – a friend of Casblancas – and, in its subtitle, to Vienna (where the young Casablancas studied, with Friedrich Cerha and Karl Heinz Fűssl). It is some years since I read Noteboom’s novel, but my memory is that it traces the ultimately unsuccessful relationship between a Dutch photographer and a Japanese model, with the unattainability of the model (Satoko) suggesting how one can never entirely ‘possess’ another culture. The title of the first work on the disc, Dove of Peace, immediately evokes memories of Picasso’s 1949 lithograph which, as ‘Dove of Peace’ was adopted as the emblem for Paris Peace Conference of the same year and later, in many variants, adopted by a variety of peace movements and conferences. The ‘model’ for the original was apparently one of the doves owned by Picasso’s fellow artist Henri Matisse. Doves had long been of interest to Picasso – during his childhood in Malaga his father bred rock-doves and had a local fame as a painter of birds – and as early as 1901 (when 20) Pablo Picasso painted his beautiful Child Holding A Dove. Even though the famous ‘Dove of Peace’ was widely used for propaganda purposes, Picasso wasn’t so naïve as to take a simplistic view of peace; he was well aware that Peace and War existed in a continuous dialogue, repeatedly in battle, as it were, for temporary supremacy. That same realization seems to underlie Casblancas’ Homage to Picasso. Dove of Peace – a concerto for clarinet and chamber orchestra – was commissioned by the Royal Liverpool Philharmonic and the first performance was given in 2010 to coincide with the opening of an exhibition, ‘Picasso: Peace and Freedom’ at Tate Liverpool. Played as one continuous movement, Casablancas’ work seems to fall into five sections. A relatively brief opening section creates a mood of quasi-pastoral innocence, which is soon overtaken by passages of violent ‘conflict’ (it is hard not to think of Guernica and the destruction of a village on market day), to be replaced in turn by a central panel (as it were) which is more lyrical in nature. Once again, other energies take over as the music increases in momentum until it reaches a climax. The work ends with a concluding passage in which seem to rise (temporarily at least) above conflict. However, the sense of ‘peace’ in this close is problematic – there is no sense that this a peace to “end wars”. When, in November 1918, Lloyd George announced the terms of the Armistice he said “I hope we may say that thus, this fateful morning, came to an end all wars”. Casablancas’ music has even less confidence, I think. It cannot, insofar as he seems to share Picasso’s sense that peace is ‘defined’ by wars and wars by peace; a view which history seems to confirm. Casablancas’ musical argument isn’t always easy to follow, but the music is always exciting and often beautiful, mingling the consonant and the dissonant with great skill. The members of London Sinfonietta and the soloist, Mark van de Wiel, taken from their ranks, play with passion, intelligence and perception throughout. Dove of Peace is perhaps the major work here – surely a work which will find further performances and will be of lasting interest. But there are other fine things on this CD too. Track 9 brings us another fascinating work. It has as its title a quotation: “der graue Wald sic unter ihm schűltelte”. This, although the documentation with the disc seems nowhere to tell one so, is a quotation from Georg Bűchner’s novella Lenz (1835). In his translation of the novella (published by John Calder in 1996), Michael Hamburger Englishes the passage thus: “the grey forest shook itself beneath him”. Bűchner’s story is historically grounded in the life of Jakob Michael Lenz (1751-1792), a German writer who suffered a mental breakdown while making a trip through the Vosges mountains in 1777. He was never really free of mental illness thereafter – he suffered from what would probably now be diagnosed as paranoid schizophrenia. Bűchner’s novella – which formed the basis for Wolfgang Rihm’s chamber opera Jakob Lenz (1979) – juxtaposes the beauty of the landscape with the mental disturbance of the young Lenz. Casablancas’ music, building on something like the same antithesis, unites, like all good music, mood and architecture, from the beautiful horn calls of the opening (Michael Thompson, another member of London Sinfonietta, takes the solo role – admirably) through the fragmentation of some of the later music – echoing both Lenz’s increasing disturbance of mind and the way Bűchner imagines his narrative. Hamburger comments, introducing his translation, that Bűchner’s Lenz has an “unusual narrative style, with its repetitions, ellipses and colloquialism”. Casablancas’ composition was commissioned by the Cantus Ensemble of Croatia and premiered in Zagreb in May of 2011. Near its close Casablancas quotes (we are told by Krieger) a Croatian folk song. On the title page of Casablancas’ score (which I have only seen online) the quotation from Bűchner is followed by the single word ‘Nachtmusik’, in parentheses. The word is very apt for the music, in which the dominant idiom seems to owe something, at least, to Bartok’s night music. Given the subject matter – Lenz’s sad breakdown – the work naturally has some disturbing moments, but there is a compensating grandeur at times, too. This is another perceptive and sensitive performance. I suspect that the two works so far discussed will be the ones to which I shall choose to return most often. But saying that is not intended as a dismissal of the rest of this fine disc. Octeto and Dance, Song and Celebration, for example, are both interesting in themselves and also serve to show how various a composer Casablancas can be. The concision of Octeto, especially heard after the relative expansiveness of Dove of Peace is characteristic of one side of a composer who has often made clear his fascination with the haiku, the seventeen-syllable Japanese poetic form – and who has, on several occasions, used words like ‘haiku’, epigram’ and ‘aphorism’ in the titles of his compositions. Dance, Song and Celebration is not so brief and is perhaps more characteristically Catalan than anything else on this disc. This is apt, of course, in a tribute to Xavier Montsalvatge, surely the major figure in Catalonian music during the second half of the twentieth century (as composer, critic and teacher). As Felix Krieger says of this piece “it evokes the Mediterranean atmosphere of the composer’s home town and the bright clarity of its light”. (Though Casablancas was born in Sabadell, some 10-12 miles north of Barcelona, I imagine that by “home town” Krieger is here referring to Barcelona, Casablancas’ base for most of his adult life). Casablancas, though he has a loyalty to his native Catalonia, is essentially an internationalist, a man of deep and wide culture, as reflected in his music. The composer attended the London recording sessions for this CD and Krieger closes his notes by thanking him for “his always warm and supportive advice”. Certainly, the performances are full of the intelligence, vitality and, yes, wit which are typical of the music of Benet Casablancas.